Blogger has just launched a set of incredible perspective views which can turn your blogs into stunning examples of CSS3 and HTML5 Technologies. 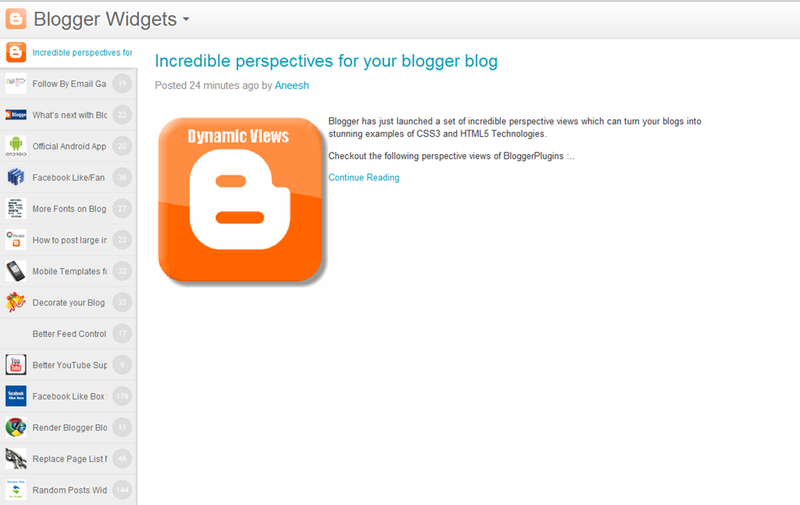 Checkout the following perspective views of BloggerPlugins :..
Also check out this awesome video by the blogger team!! Loved it, and can’t wait to see your blog in these perspectives? Go ahead, fill this form,click the generate links button and get the links to view your blog in these dynamic views. Checkout the below links after typing in your Blog url in the above text box. The blogs do look a lot better in the new views, I cannot wait have all the new stuff up and running. The wordpress guys don't even know what they are missing ! I want to show ads in the post pages, so how did you do that it will show the "continue reading" button? and not the full post. Secondly, How can i redirect my homepage url to be one of those views? Tnx. 2. you can use meta redirect tags to do that, but its not a good way of doing it. heya....will these links be crawled by mr.spider/google? i have a website full of picture quizzes...so these five views work gr8 for me..........anyways.all these views are super useless for websites have more of text based content......hello....can i redirect all my traffic to home page to this type of view....is it legal(or advisable)? Yep I do agree with 'Blogger Sam' The wordpress guys don't even know what they are missing :) !. Thanx for the review. Peace!!! When will it be open for everyone or how can I change the view? Ya, when do we all get to try this new look. Love to change my barbecue blog up. I am a regular reader of your blog and you've always helped me to get something new. yeh the perspectives are really great! thanks for telling about them! "Sorry, dynamic views aren't available for this blog." Really excited about this! When does this launch exactly? I've simply installed a set of five tiny buttons in the right-hand sidebar of my Antipodes blog, allowing readers to choose the various views. It's a fact that tastes have evolved to the point where many readers prefer the "lean look" of these image-inspired views to the ordinary original appearance of my blog. Incidentally, why doesn't the Blogger team offer us new text-inspired views of our blogs, including a PDF download of the total blog contents? I tried it on my blog and it totally blown me away.. awesomeness!!! Very neat and more readable... great options for my readers. Well, it's good to know that blogger is doin' something to upgrade and satisfy their users. I'm sure, more plugins will be made available soon as part of their expansion program. Fantastic! 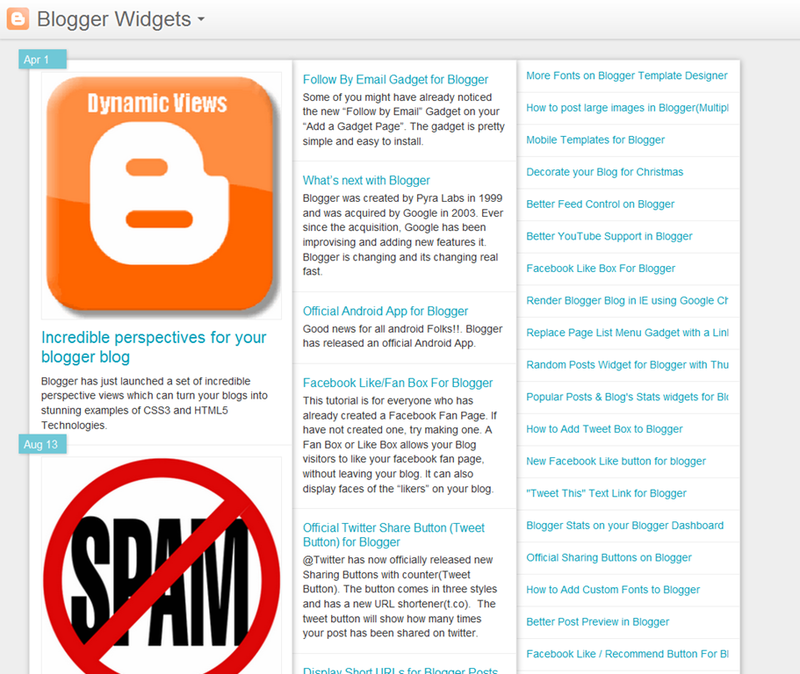 Thanks for sharing the post on Blogger Plugins! nice one aneesh but when i write my blog www.jasica.in nothing come out..as said..you must fix that ..so that we can see how it would look like after the change...but i wanna use this just for related posts.. can i ? I love the flipcard on my blog; however since it is a PHOTO blog, there is no reason to visit my site now. I can't believe google would let this fly without some way to get adsense in there-maybe that is coming... This will also make the analytics harder to track right? Woowwww!!! It's sooo cool! :) Thank God. People have been pestering me to switch to tumblr and/or wordpress , but I stayed because everyone else was using those platforms and I like blogspot, so there. WoW gr8 ! but what about blogger automatically deleting blogs ? and marking them as spam ? has this stopped ? I'm afraid of loosing my blog. Please tell me how to add facebook become a fan box below post in blogger?? for posting like that post. I love blogspot platform and I won't leave it for anything else. It's all I have ever dreamed of. Thanks. I am new to blogger , came from one group blog siet. with smieleys and also possibility taht people who leave the comment can uplaod picture or clip with it.Are there any plans for thia in the future? how to add these effects boss ?? @Walkarounds - i think you haven't read the post completely. sorry but noone gave me an answer why dynamic view is not available in my blog. I have read and done exactly what to install this, enable Dynamic view in settings option and fix the rss feed too but it is impossible. How can I fix this problem? GOOGLE ADSENSE NOT WORKING IN THIS VIEW !!! This is cool an all, but the fatal flaw is that you have to depend on the user knowing how to do this instead of just making a view-switcher button available on the blog site itself. I can't get this to generate my links! Cool! I will go for obviously Snapshot and blogger sidebar. They really works smart and make your blogs dazzling for the viewers. Just do it for your blogs and motivate your ordinary blogs to a new edge of perfection.